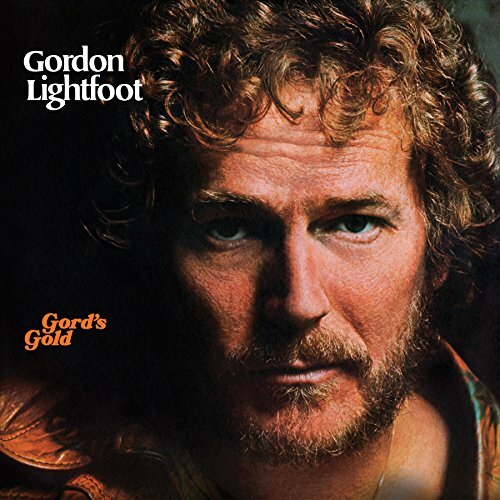 The Gord's Gold album is a compilation of Gordon Lightfoot's very best songs up to the time of its original release as an LP (1975). The CD contains 11 songs originally recorded at United Artists (four in medleys of two songs) and 12 songs from his first five albums at Warner Brothers/Reprise. The vinyl and MP3 albums contain one additonal song, "Affair on Eighth Avenue." Three of his four biggest commercial hits are on this album ("If You Could Read My Mind," "Sundown," and "Carefree Highway") making this an excellent first Gordon Lightfoot album to buy. (The fourth big hit, "Wreck Of The Edmund Fitzgerald," was written and recorded later in 1975; the shipwreck was November 10th, remember). You can find it on Summertime Dream, Complete Greatest Hits, Songbook (box set) or, in a rerecorded version, on Gord's Gold Volume II). Read full review below. Affair On 8th Avenue was omitted from the CD because - at the time - it would have made the total time slightly more than CD capacity. Today, it would fit. Great news this summer: the Gord's Gold album will be released by Friday Music on 180 gram, audiophile vinyl, with an expected release date of August 26th. It is available for order now: Gord's Gold Audiophile LP set (Amazon.com) and (Amazon.ca). The release of Gord's Gold follows audiophile vinyl releases of Sit Down Young Stranger and Sundown, as well as his "All Live" album of Massey performances. The release is a "Limited Edition", and will include the original, double pocket gatefold cover artwork, with photos and liner notes from the 1975 release. The album was mastered by Joe Reagoso from the original Reprise Records tapes at Friday Music Studios and Capitol Mastering in Hollywood. The Gord's Gold album is a compilation of Gordon Lightfoot's very best songs up to the time of its original release as an LP (1975). The CD contains 11 songs originally recorded at United Artists (four in medleys of two songs) and 12 songs from his first five albums at Warner Brothers/Reprise. The vinyl and MP3 albums contain one additonal song, "Affair on Eighth Avenue." Three of his four biggest commercial hits are on this album ("If You Could Read My Mind," "Sundown," and "Carefree Highway") making this an excellent first Gordon Lightfoot album to buy. (The fourth big hit, "Wreck Of The Edmund Fitzgerald," was written and recorded later in 1975; the shipwreck was November 10th, remember). You can find it on Summertime Dream, Complete Greatest Hits, Songbook (box set) or, in a rerecorded version, on Gord's Gold Volume II). The rerecorded songs from his UA period ('66 - '69) are all truly exceptional songs. A true Lightfoot fan would want to have both the original UA recording (in a much simpler style) and this one, but there is no arguing with the fact that the Gord's Gold versions of these songs are exquisite. In particular, the recording of Canadian Railroad Trilogy, perhaps his finest song, sends chills down my spine and the recordings of Early Mornin' Rain and the medleys For Lovin' Me / Did She Mention My Name and I'm Not Sayin' / Ribbon Of Darkness demonstrate his songwriting and singing at their very finest. In addition to the three top-10 hits from his Warner Brothers years, Lightfoot has included several other masterpieces of that era. My favorites of these are Minstrel Of The Dawn, Beautiful and Don Quixote. This album is a 'must have'.